THE RUNNING JOKE among Oklahoma City Thunder media is there are two Russell Westbrooks: the one who's wearing basketball shoes, and the one who isn't wearing basketball shoes. On the court, he's Russell Westbrook, the inferno of energy, anger and intensity. He's terse with reporters, unfriendly to opponents and yells the F-word at everything -- whether it's an ugly turnover, a dagger 3-pointer over two defenders or a fundamental post-entry pass. Then there's Russ, the affable jokester who runs the Thunder locker room. He's charming, witty and razor-sharp with a comeback. He's even chatty, open to talking about fashion, food, whatever. Just don't tell anyone; Russell Westbrook wouldn't want you to know. Westbrook is an enigma wrapped in $1,200 designer jeans. He's a teddy bear with real teeth. He's an unknown commodity and an open book. He's the guy with an "entourage" consisting of his mom, Shannon, his dad, Russell Jr., his brother, Raynard, his wife, Nina, and his adorable Maltese, "The Brodie" ... which is also Westbrook's sort-of nickname for himself and his brother. Does it make sense? Of course not. But that's Westbrook. Here are 39 other things you may or may not know about the man, the myth, the legend. He wears each outfit only one time. And then gives them away. Westbrook does everything with his left hand -- sign autographs, brush his teeth, throw a football -- except shoot a basketball. An honor student at Leuzinger High School in Lawndale, California, Westbrook says he was accepted to Stanford and offered an academic scholarship. He says he probably wouldn't have ended up going because tuition was still too expensive for his parents. His favorite school subject was math. He's said figuring out his outfit is like solving an equation. Westbrook won the NBA's Community Assist award last season for his work with local charities, which included opening multiple "Russell's Reading Rooms" in different Oklahoma City public schools. The former UCLA Bruin also gave a sizable donation to his alma mater's athletic department -- rumored to be in excess of $1 million -- and the new on-campus practice court now bears his name. Following the May 2013 tornadoes that ravaged the city of Moore, Oklahoma, Westbrook, while still recovering from recent knee surgery, called Thunder PR ace Matt Tumbleson with a demand: "Get me out there with the people." Hours later, Westbrook was in one of the decimated neighborhoods, on crutches, encouraging residents. He also sends a Jordan Brand package to every basketball ops employee -- like, every single person in the building -- that includes sweatsuits and shoes. He shows up at team staffers' family events. Westbrook is known to attend their children's soccer games, hockey games, dance performances and piano recitals. His wife played basketball at UCLA. That's how they met. Nina still plays in rec leagues, which her husband often attends. Around the Thunder, you hear whispers about Russ being wholly devoted to Nina -- which counts as unique in NBA circles. Except for the kind Nina cooks. He loves chocolate chip pecan cookies. And he's allergic to shellfish. He hosts a charity bowling event every year for his "Why Not?" foundation and says he typically bowls in the 190s. He has even been known to hit the bowling alley by himself. He's a bit of a neat freak. Westbrook's locker is perfectly organized. He'll take extra time to make sure his postgame laundry -- socks, undergarments -- is properly banded together before passing it off to a locker-room attendant. He eats peanut butter and jelly sandwiches before every game. But it has to be Skippy peanut butter, strawberry jelly -- not jam! -- on toasted wheat bread, cut diagonally. At least that's what Kevin Durant called him in a 2013 feature by ESPN The Magazine's Sam Alipour. "I call him Sasha Fierce," Durant said. "On the court, he's a fierce competitor. Off the court, he's chilling in front of the mirror, making sure he got the right lip balm on." He describes himself as shy. He wears two wristbands during games. One says "Why Not?" -- Westbrook's life mantra. The other says "KB3" for childhood friend Khelcey Barrs, who died in 2004 because of an undiagnosed enlarged heart. He says he has one friend on the court. Westbrook is know for always being early for practice -- sometimes two or three hours early. Thunder general manager Sam Presti likes to tell the story of how he showed up 30 minutes early at a pre-draft workout and Westbrook was nowhere to be found. After calling him, Westbrook got out of a car that was in the parking lot before Presti had arrived. His favorite number is 4. It's what he wore in high school. "Because there's four people in my family," he said, before he was married. So why does he now wear No. 0? "You go with the zero when you've been through something and you are looking to get a new beginning," he said early in his career. "It helps you get going again. It helps you get the swag back." He calls his parents before every game. 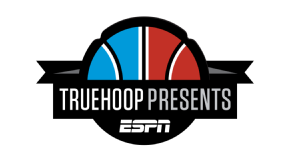 In a 2015 interview with CBS Sunday Morning, Westbrook said, "I talk to them every day. We've been so close as a family, I talk to them every day regardless of whether it's two minutes, one minute, 30 seconds. I talk to them every day. Just on ... about life and different things that may go on. All the time. Before every game, I call my parents, my brother, my fiancée as well. Sometimes it may not be about basketball, sometimes it just may be about random things. It's just something that I've done and something that works for me." He played football, baseball and tennis growing up. He was a shortstop. He played linebacker and running back. He was probably a charge-the-net-type tennis player, right? "What do you think?" he says. His favorite sports team is the Dallas Cowboys. His favorite player growing up was Magic Johnson. Though he has never called himself a Lakers fan. He watched video of all his technicals after last season. "I learned in the summertime, once they make a call, they ain't changing it," he said. "Took me a while, but I learned it. ... I watched film. I watched all my techs and all the dumb s--- I was doing, so I decided to tell myself, there's no need to argue." He led the league with 17 technicals in 2014-15; he had seven this season, only one of which resulted from a debate with a referee. He doesn't watch other teams. Sure, he watches game film to prepare. But he's not sitting on his couch on an off night to take in "Inside the NBA." "I got other things to do with my life," he says. "I got a wife. I like to shop, I got fashion. I got other things to do than watching other teams play." He couldn't dunk until he was a senior in high school. As a junior, he was 5-foot-8 and scrawny. But he grew 5 inches in the summer before his senior year and began rounding into the physical freak he is now. He wasn't aggressively recruited in high school. He had some interest from Creighton and San Diego State, but he landed on Ben Howland's radar after Jordan Farmar departed for the NBA, leaving UCLA in need of a guard. Westbrook backed up Darren Collison as a freshman, and then averaged 12.7 points per game and won Pac-10 Defensive Player of the Year as a sophomore. He sat next to Vogue editor-in-chief Anna Wintour at New York Fashion Week in 2013. Westbrook has his own line at Barneys, has his own glasses -- "Westbrook Frames" -- and routinely goes shopping on the road. His teammates often clown him for his outfits. In January, Westbrook wore a wood-brimmed hat and a poncho-looking ... thing. Durant called him a "conquistador." As Westbrook walked out of the locker room, he yelled back to Durant, "I got a horse outside!" 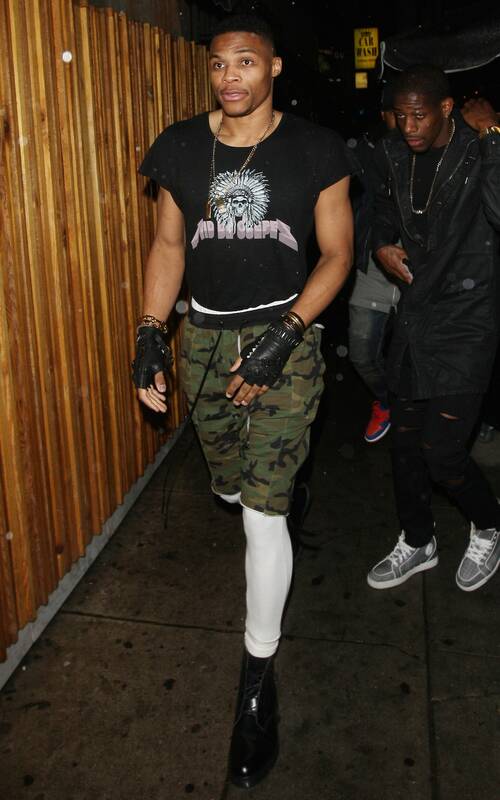 In Los Angeles, after a win over the Lakers, Westbrook sported black leather fingerless gloves. Everyone, from teammates to team personnel, had a comment. Westbrook's response to basically every one of them? "Yeah, I don't know either, man." At least, that's his claim. "I have never shaved a day in my life," he told Maxim in 2015. "I just don't really grow facial hair." He dressed up as Steven Adams for Halloween last year. Right down to the tattoos. He says he doesn't get tired. His explanation: He decides not to. He was almost in the dunk contest. During his rookie year, the final spot came down to a fan vote. But Rudy Fernandez was chosen instead. We'd all like to have that one back. He has a tell when he really doesn't like a question. Westbrook rarely -- rarely -- looks a reporter in the eye to answer a question. But if he doesn't like what you asked, he'll blink his eyes 2,000 miles per hour and make eye contact for a millisecond. He doesn't like the media. When asked why at the 2012 Finals, he quickly responded, "If you had to deal with what I do, would you?" But his brother majored in journalism. Ray graduated from the University of Central Oklahoma last spring, and Russ was the one handing him his diploma. He often listens to Katy Perry and Taylor Swift before games. "It's good s---," he said. And he always uses standard iPhone earbuds. He's trying (has tried?) to learn guitar. His wife bought him an acoustic for Christmas two years ago. Asked how that was going last season, Westbrook said, "Yeah, I'm gonna need a lesson." Before that, he played air guitar on his crutches. While listening to T-Swift, of course.